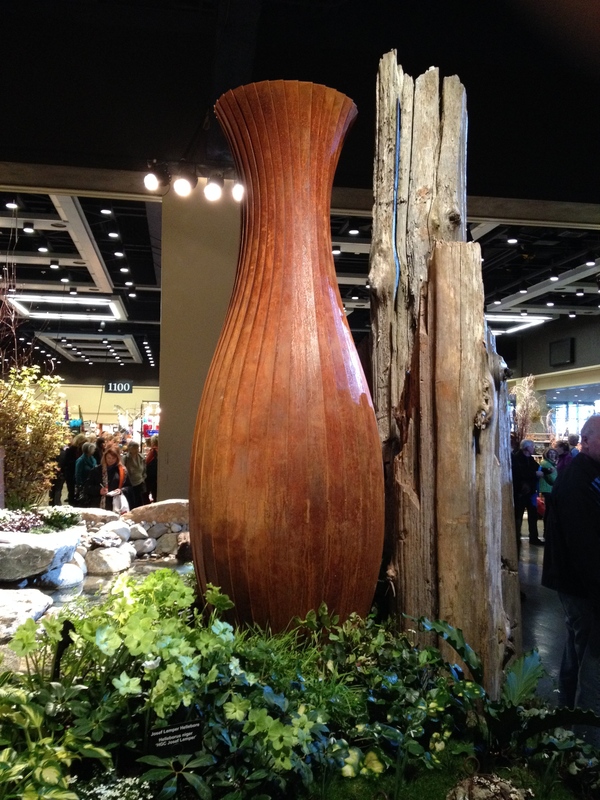 The first weekend in February is usually the Northwest Flower and Garden Show. This extravaganza takes place right when we are getting tired of our gloomy, grey, damp winter. It helps us turn the corner to spring, or at least to have hope that spring is not far away. When I first started going to the show, years ago, I went with my mom, and it was a day away from my young children. I desperately needed the breaks in those years, and came away refreshed and inspired. I remember thinking then, “Why do people bring their kids to this show? They’re crazy to brave the crowds!” But now that I’ve taken my kids to the show for a few years in a row, I’ve changed my tune. Now, my kids look forward to going. They save their allowances for several months. Gabriel plans out in advance what he wants to buy in the market place. They talk about the show all year long, and want to spend the whole day there. We figured out that bus fare was as much as parking costs this year, so we drove downtown and parked at the Convention Center. It made it so much easier to come home with our tired arms full of treasures than it was in previous years on the bus. We got there soon after the show opened, worked our way up the escalators, and got our show paper to plan out what we were going to do. The fragrance when we first walked into the show – oh, it was heavenly! Gabriel wanted to go to a seminar at 10:00, so we checked our coats and did a quick walk-through of the fabulous display gardens. 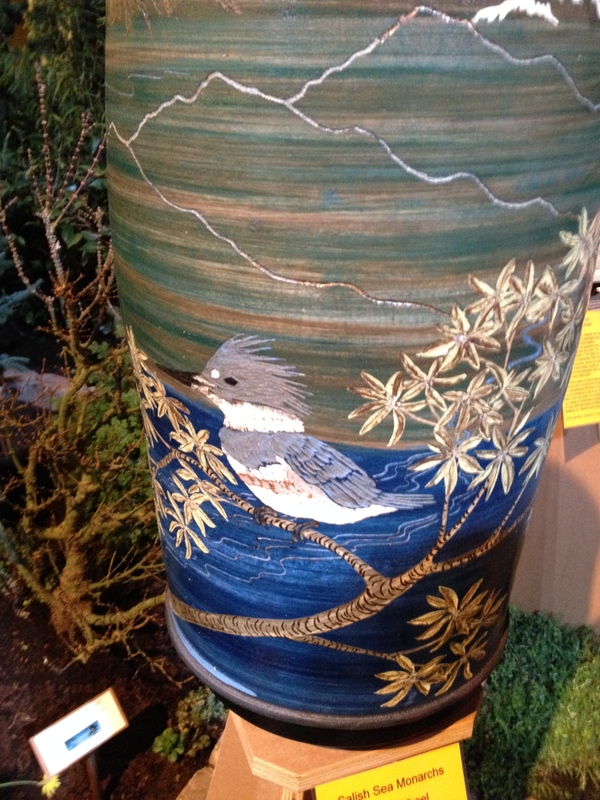 Gabriel was intrigued by the seminar called “The Color Full Garden” by Lucy Hardiman, a Portland-area designer and author. Her presentation spoke to the artist side of my son, and I enjoyed being encouraged to think about colors in different ways. After the seminar, we walked around the display gardens for awhile, working on the scavenger hunt. It’s interesting to see what changes in the gardens year to year, and what stays the same. 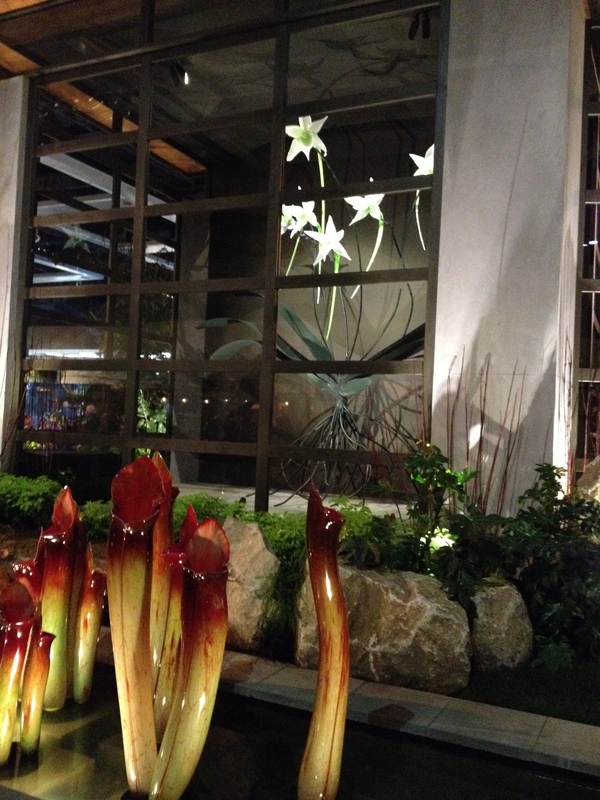 This year we noticed a definite theme around carnivorous plants, with many gardens incorporating pitcher plants into the design. 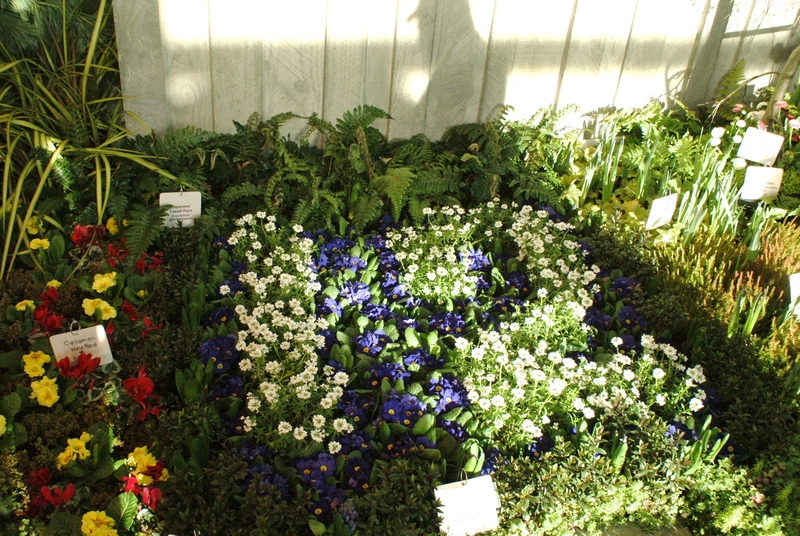 The theme this year was “Art In Bloom,” and we appreciated the combinations of gardening and art throughout the exhibition. 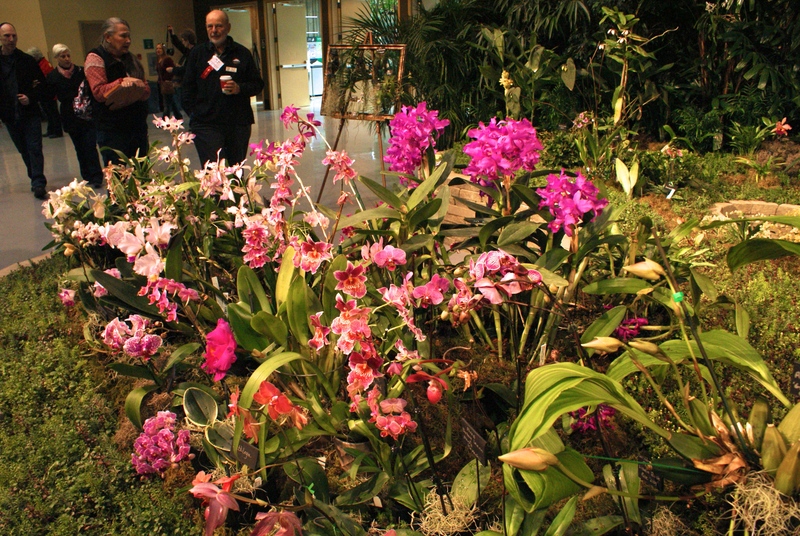 Gabriel’s favorite garden was that of the Northwest Orchid Society. 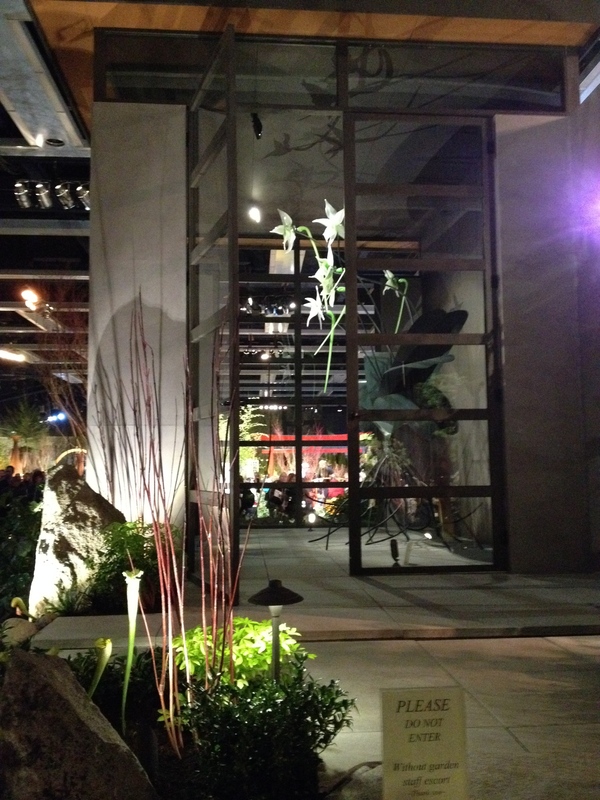 I’m not sure I can pick a favorite myself – I enjoyed the Orchid Society display, as well as the ART-itecture for Urban Wildlife by the Association of Professional Landscape Designers. 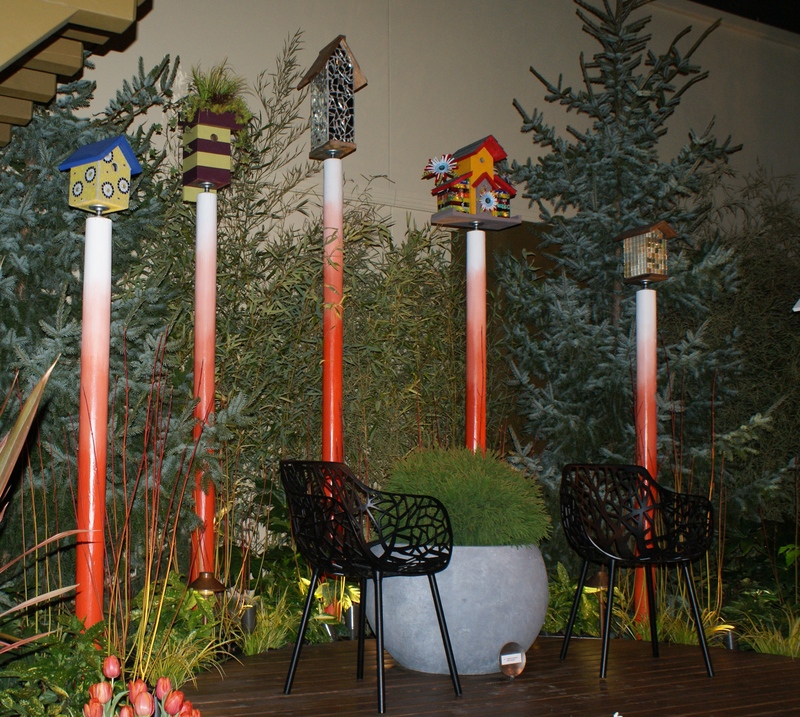 I liked the funky birdhouses, and was smitten by the chairs. 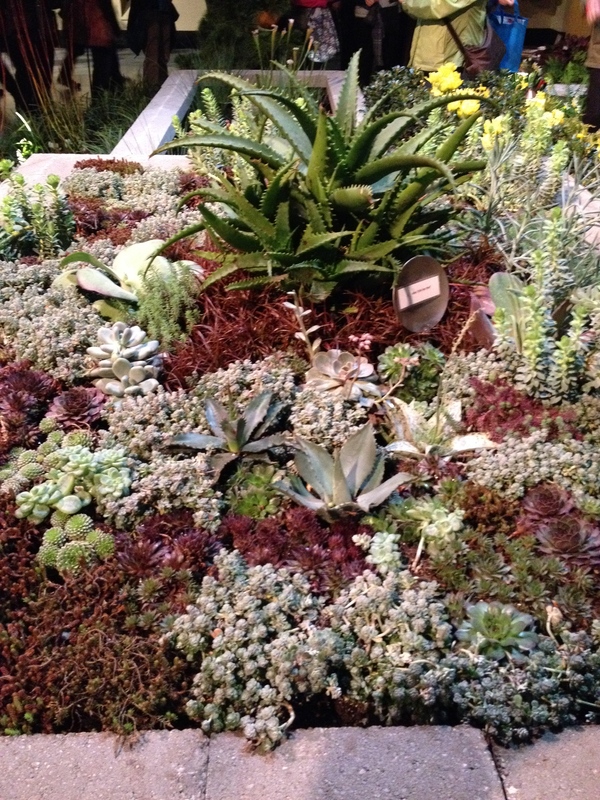 They had an interesting display of sedums, too, variations in color and texture. 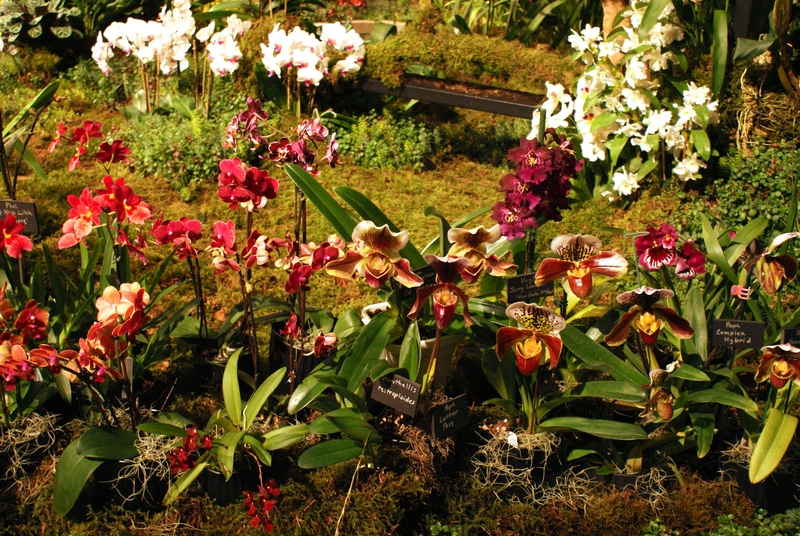 The garden titled Darwin’s Muse made me gasp – it contained a huge glass-blown orchid in a house, and a collection of glass pitcher plants. This garden was designed by Karen Stefonick, Steven Spear, and Moon Shadows Landscaping. I found myself gazing at the orchid throughout the day as we passed near, or in between other activities. We visited the Children’s Area after lunch. They had different sponsors this year, and it didn’t work for me. 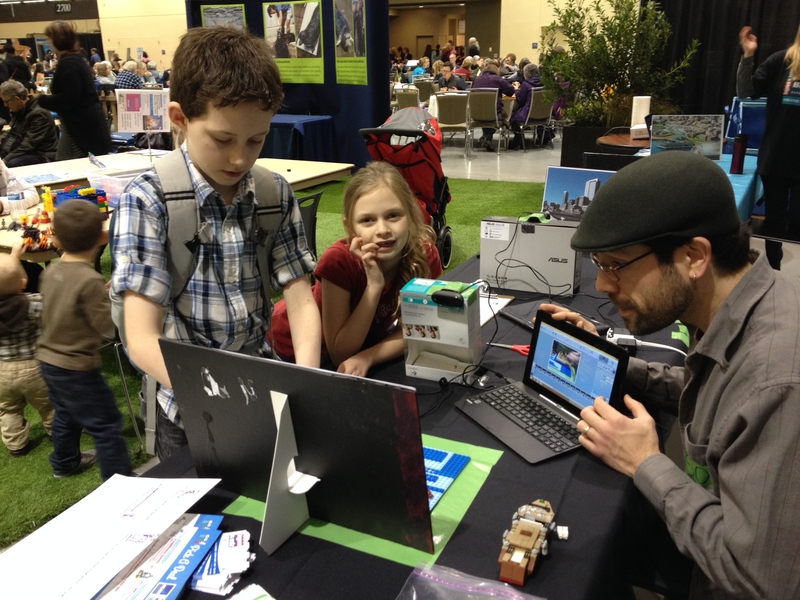 The kids did, however, get a chance to make a stop-motion Lego movie, and they were thrilled to plant a “terrarium” with sedums. I’ll say more about this section later on. We spent quite a bit of time walking through the marketplace, agonizing over what plants to take home with our limited budgets. 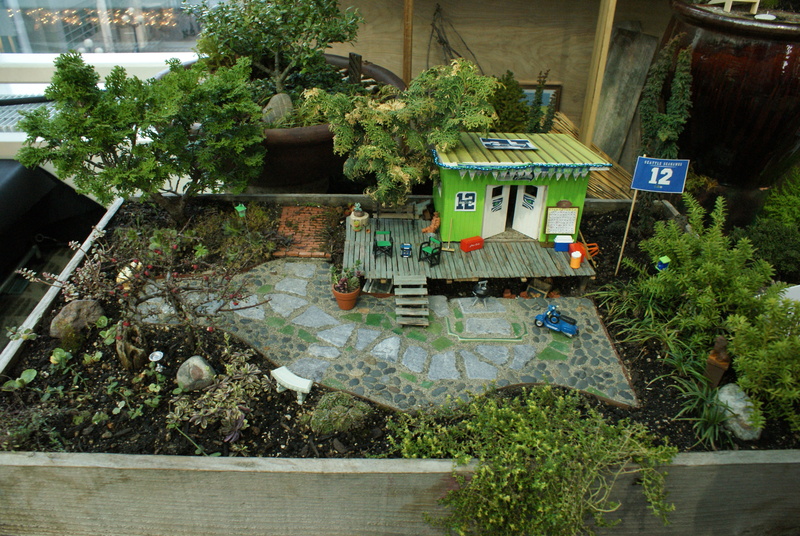 We strolled through the container gardens and the miniature creations, which gave us some new ideas for the kids’ fairy gardens. 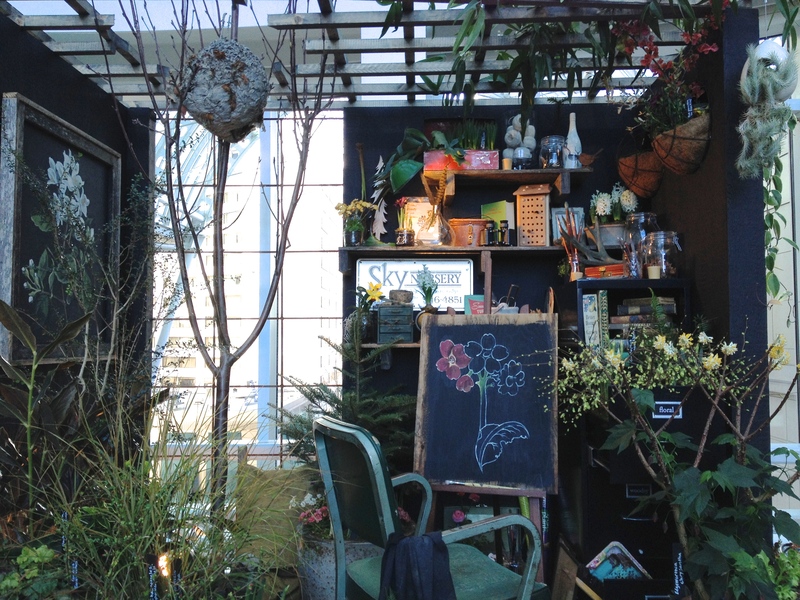 I enjoyed the display put up by Sky Nursery – a room or office filled with plants and art and lushness; I just wanted to live there! Annika was bummed that she didn’t save enough money to buy fairy garden supplies, but I reminded her she could ask for some for her birthday, and we could find some of these props at local garden centers. As much as we enjoyed the main show, we were pretty disappointed in the kids’ portions. The new sponsor of the play area seemed like they planned more of an advertisement for their programs rather than thinking through what would make a good play space. We can play with Lego every day. It’s easy to be connected to technology. But having a space to play that refreshes and inspires – that’s more difficult. I was thinking back to previous years when we would spend more time in the kids’ area, wondering what the difference was. 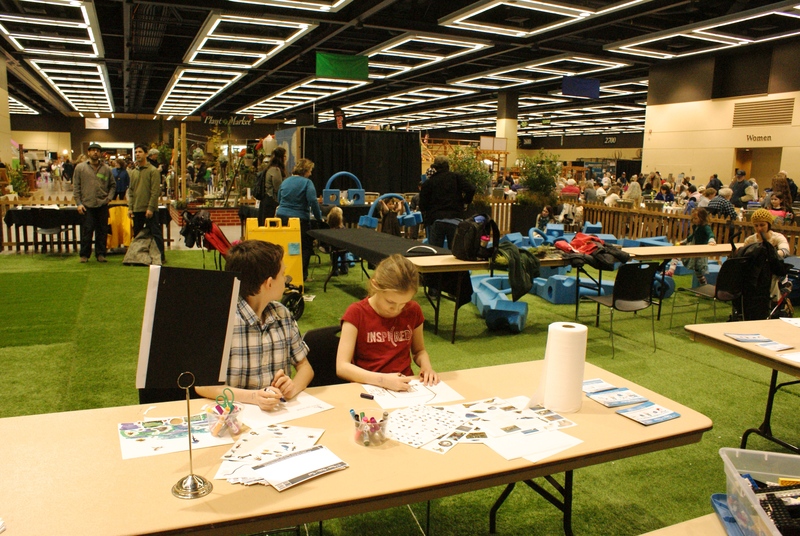 In the past, there were spaces for the kids to dig, to get dirty, to get their wiggles out, to pet animals – to counteract the sensory overload of the main show with activities from the natural world. The space this year, in contrast, felt sterile and did nothing to refresh us. We didn’t spend much time there. I felt the area lacked vision, and I hope that next year the organizers can get some more of our area’s excellent nature educators to help create a more inspiring area. 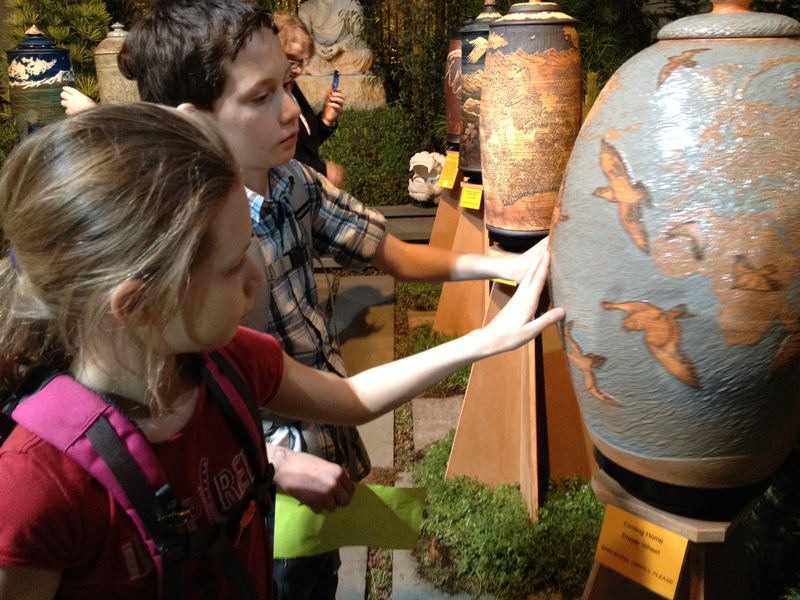 In addition to our disappointment with the kids’ area, my kids were very disappointed with the treasure hunt. Every year they have high expectations for the “prize” for completing the hunt, and usually they end up feeling let down (but they did like the plants they got last year). But this year was the worst. We spent most of the day (a couple of hours, at least) looking through all the gardens to find the hidden picture frames. The kids were focused and determined. They both wrote the locations for each frame themselves (Annika is still learning to write, and this was painstaking.) And when we got done, the prize was – plastic spider rings. And plastic pretend metal rings. It was all I could do to remain gracious when I saw the basket of rings, and saw my kids’ faces sink. I had tried to help the kids keep their expectations down, to help them remember they could do the treasure hunt just for the joy of it and not expect a prize. But it was still tough. 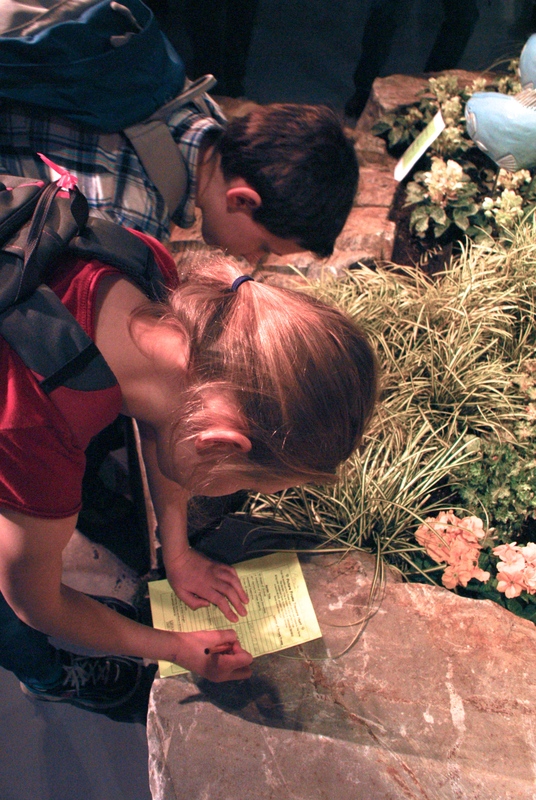 In my opinion, if the folks at the Flower and Garden Show want to continue to do the treasure hunt each year (and it is a fun activity that keeps us observing through every garden) they should make it be just for the fun of it, or make sure the “prizes” are actually worthwhile. Some ideas would be plants (my kids were thrilled with the sedums they got in the kids’ area), polished rocks, or pretty notebooks. 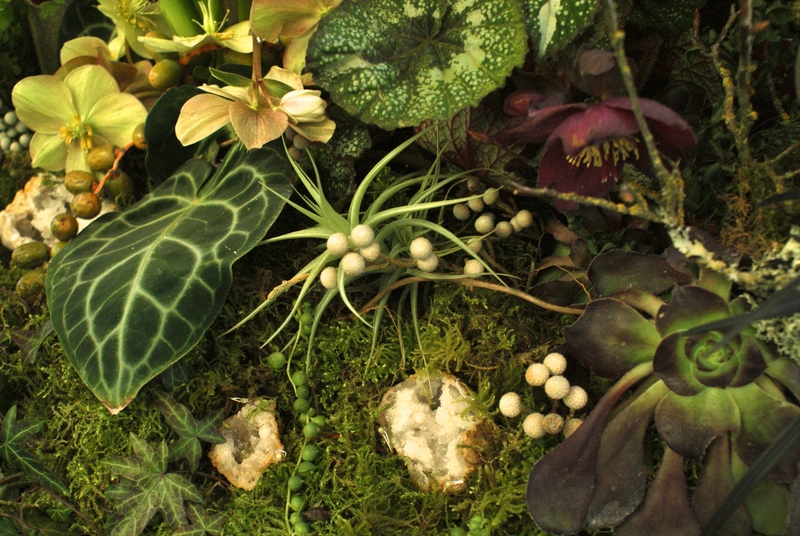 Or perhaps they could partner with some of the bigger sponsors and offer a real book, a nicer plant, a cool pot, fairy garden supplies, gloves for working outside, or any number of other nature-themed objects. Pretty much anything would be better than cheap junky trinkets. OK, I’m done with my criticism. Despite my dissatisfaction with the children’s portions, my kids were thrilled with the show, and we really enjoyed our day there. We brought our plants home, and had to wait a few days to plant them, since the ground was frozen solid. Both the kids have gotten their plants planted by now, and are eagerly awaiting blooms and new growth. They each bought an orchid, and found the perfect place to showcase them. They are already talking about next year, and wondering how they can earn more money for more plants. I guess I’ll have to come up with more chores for them to do! What a delightful post this is!